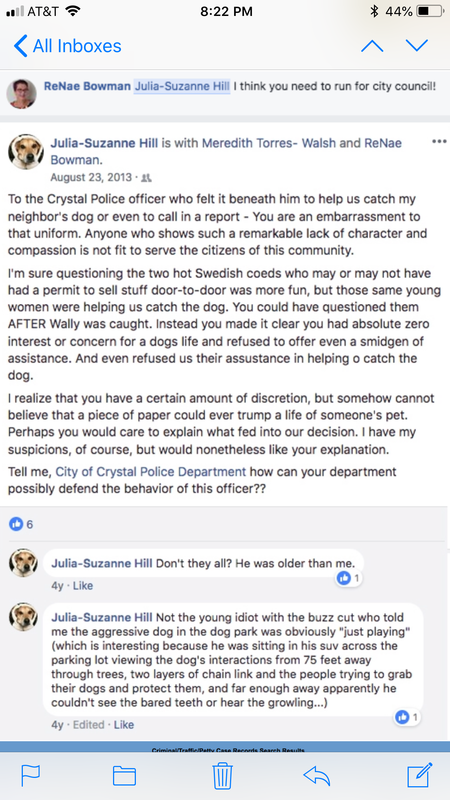 A few months ago we did a post on Crystal City Council candidate Julia Hill threatening to clothesline kids who come near and scare her dog. As serious as that was, this Facebook post from a few years ago directed at the Crystal police is a tad more serious. Hill then implies that something else “fed into the decision to allegedly care about Swedish coeds over a neighbor’s dog” and she has her suspicions of what that was. Huh? And don’t you love calling the officer a young idiot with a buzz cut? Are you going to use language like this on the council when you don’t get your way? Any police officers want this woman in charge of them? Meanwhile her buddy ReNae Bowman is making fun of everyone else. Look what she says about Jeff Kolb swearing in a police officer. Seldom in western civilization have I seen someone so ignorant. Bowman claims the city has no money for parks, roads, and utilities but the truth is the city is rebuilding Welcome Park and Becker Park and paying for the Mill and Overlay projects with cash and they paid cash for a new Public Works Building avoiding costly borrowing. What part of that aren’t you smart enough to understand? So you’re 0 for 3 Ms. Bowman. She then calls this a “photo-op” for Councilman Jeff Kolb. Really? 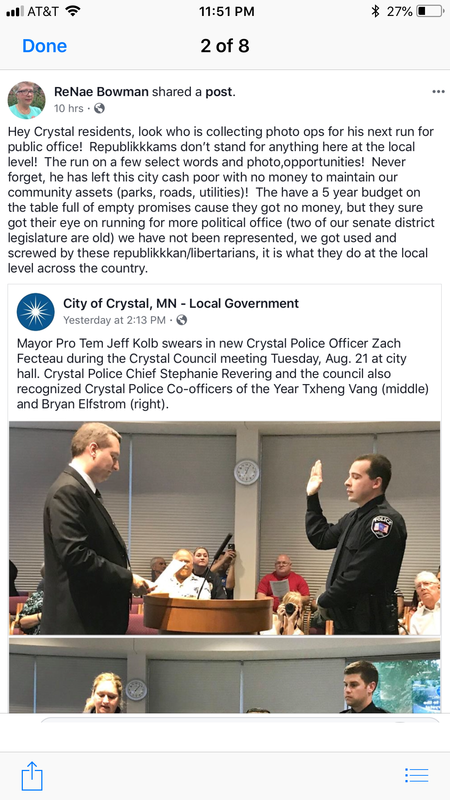 As the Mayor Pro Tem isn’t it his job to swear in a new officer? You swore in new officers when you the mayor, was that a photo op? Talk about being delusional and being full of hate. And I always laugh at a KKK reference since they are a Democratic creation. 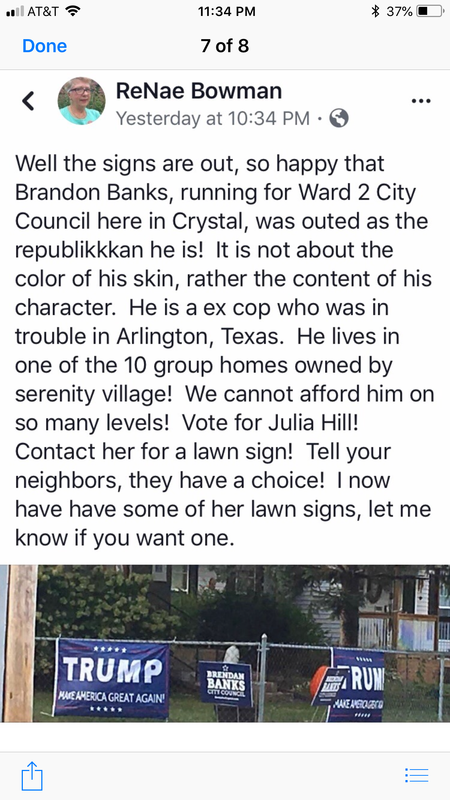 Her hatred continues as she slams Ms. Hill’s opponent Brendan Banks…..
Not about the color of skin but content of character? Since when does the left believe that? Bowman then goes on to make fun of where Mr. Banks lives. I thought the DFL was the champion of the downtrodden and the poor and the disadvantaged? I guess that only applies if minorities stay on their plantation. She claims he’s being “outed” as a Republican because one house has his sign with a Trump sign. That’s funny I thought this was a non partisan race. Can’t he have signs everywhere? As always, Democrats think these seats are their possession and act like 4 year olds when they don’t have the power they crave. She then gives the kiss of death to Julia Hill…..a ReNae endorsement! Oh God! Ms. Hill a word of advice; if you stand any chance to win this race, get as far from the former mayor as possible. If you don’t believe me, check the results of the last three or four elections cycles here in Crystal. Bob Uecker is batting higher than ReNae. And what would be ReNae Bowman without petty attacks on yours truly…..
LOL! First off what is this lil’ Andy Stuff? Is that supposed to be funny? I can take a joke but I don’t get it. I’m the biggest name caller in the district? Yeah whatever. Only in her “mind” is that true. 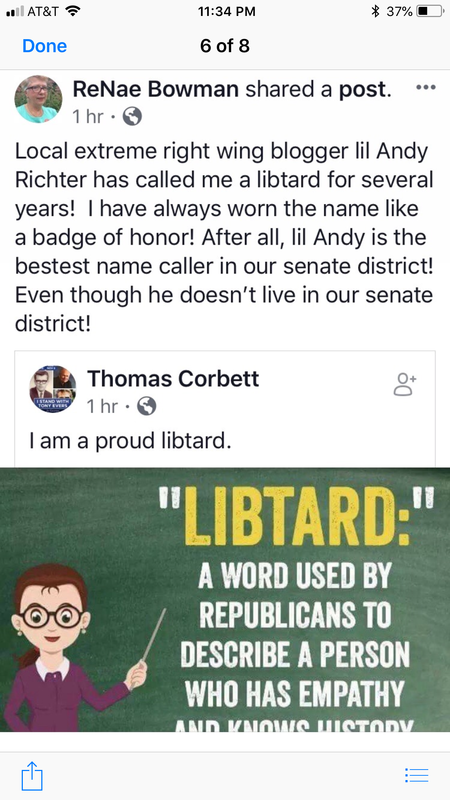 I don’t recall calling anyone a libtard; with her I don’t have to. Her behavior is such that no name calling is needed. And, as always Ms. Bowman plays the victim and tries to make people feel sorry for her. Here she supports a social media ban! 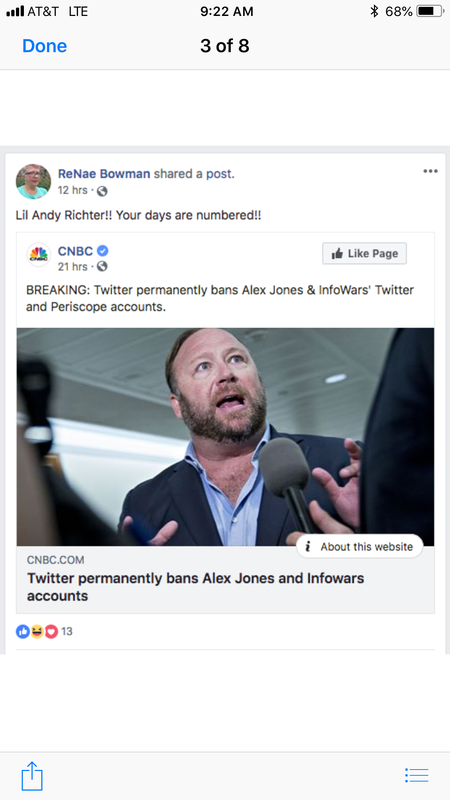 It’s interesting to know that the former mayor supports banning people in social media. I guess she doesn’t support freedom of speech. What if someone bans you Ms. Bowman? Will you be cheering or will you be a cry baby playing the victim? It’s strange to compare me to Alex Jones. I’m not sure I’ve ever publicly supported anything he does or says. Sometimes I agree with him, sometimes I don’t. Either way, the man has a right to free speech. I also love the notion that my days are numbered. I could take that as a threat, but it’s more of an act of desperation. My days aren’t numbered. My movement is growing. You are the dinosaur Ms. Bowman, and you will bring people like Julia Hill down with you. Entry filed under: City Government, Crystal. Tags: Brendan Banks, Crystal City Council, Julia Hill, Julia Suzanne Hill, ReNae Bowman. Dear FORMER Bowman as we say down south “Bless her heart”. (hint that is not a compliment). Remind me again who throws insults, epithets and hateful language around? Projection much? Using the term Republikkkan to describe an African-American. If this was a Republican calling an African-American a name you can be sure she would be screaming “racist” from the hilltops! What a hypocrite. Please do not vote for Julia Hill.